Many of you expressed total excitement when you saw the artwork of dresses that embodied Avengers characters. These drawings came from Amanda Hemmons, a 25-year-old Seattle artist. Amanda is also daughter of Big Fish Games’ Portuguese language editor, and when she reached out to her mom about creating a similar drawing featuring video game characters, Big Fish Games jumped at the opportunity. Check out Amanda’s designs below, which Big Fish Games will have on display at GeekGirlCon ‘12. 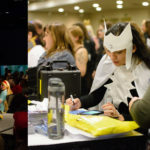 As GeekGirlCon President Erica McGillivray mentioned in a Wired interview about the designs, we love that they feature a range of clothing styles and include different body types and ethnicities. On top of that, these are some really great interpretations that we think will inspire cosplayers. Could you guess all the video game characters? You can confirm your guesses over at Big Fish Games’ blog. Be sure to check them out in person at our convention this weekend (and don’t forget to buy your passes before we sell out). Great concepts and very refreshing.